Maverick Viñales (Yamaha) survived Q1 and moved to Q2 at Valencia earlier today, and then proceeded to take pole position in Q2. 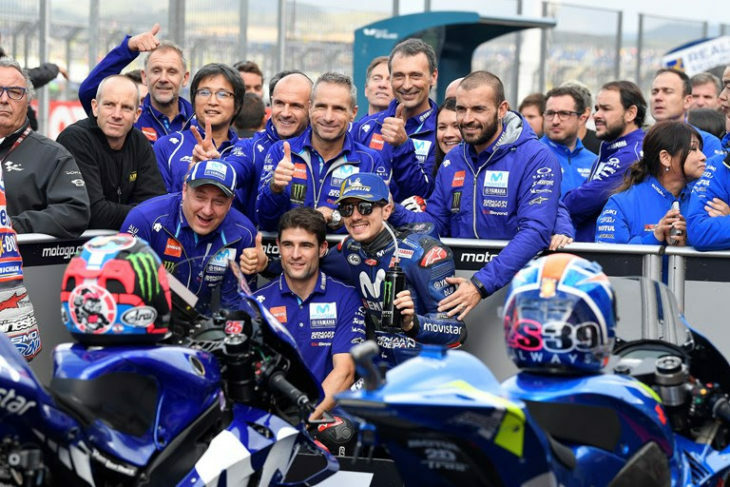 Apparently, Viñales is only the second rider in MotoGP history to ever participate in Q1 and then take pole. Joining Viñales on the front row for tomorrow’s race will be Alex Rins (Suzuki) in the second position, and Andrea Dovizioso (Ducati) in third. Champ Marc Marquez (Honda) crashed and dislocated his shoulder on the first lap of Q2, but was still able to get on his second bike and qualify fifth. How about those Espargaro brothers? KTM in 6th and Aprilia in 8th. And Rossi down in 16th! Aprilia has been steadily creeping toward the front, the KTM in 6th is an amazing leap forward. I hope they can both keep improving. It’s good for the series. When Marquez won the championship and they had it all prepared to change his bike and helmet, i read he dislocated his shoulder then, hope that isnt a problem next year, or even this race. The shoulder injury has been reoccurring. He had issues during his celebration because Redding congratulated him with an extra loving slap. Kind of crazy, he laid on the ground, and his brother popped it back in.